The discussions about the European Union budget for 2014 to 2020 continue for the second day at the EU summit. EU President Van Rompuy proposed a budget that includes 960 billion Euros of spending and 908.4 billion of payments. The 960 billion Euros of spending would be 12 billion less than the budget proposed at the November summit. Finnish Europe Minister Stubb tweeted from within the meeting that EU leaders are near a take it or leave it moment. The EU parliament has to approve any deal agreed upon by leaders at the summit. An agreement on a new budget would probably be Euro positive as it would bring further stability to the region, but the exact reaction would depend on the contents of the budget deal. Also in Europe, the German trade balance dropped to 12.0 billion Euros in December, which sent the Euro below 1.3400 against the US Dollar in Forex markets. However, those losses were quickly erased and EUR/USD is trading slightly higher in today’s session following yesterday’s Draghi spurred losses. 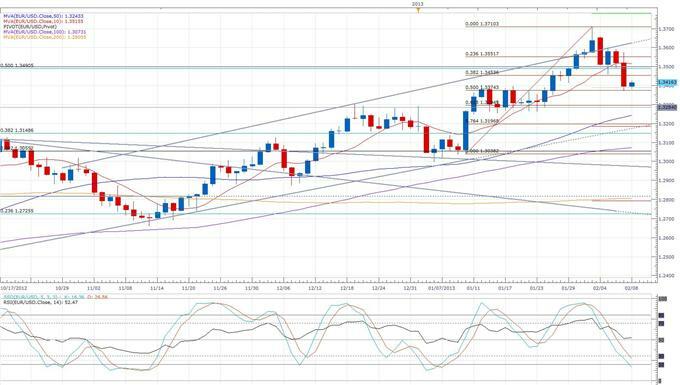 Resistance might now be seen by the key 1.3500 line, and a broken resistance line around 1.3374 could provide support. In Japan, a mix of late comments from different officials and the car company Nissan gave the Yen some strength in trading. BoJ Governor said the recent Yen weakness will support the economy and he expects a recovery in 2013. But Yen rallied about 100 points against the US Dollar following Nissan’s Forex forecast for fiscal year 2013. Nissan kept the forecast for Yen at 79.7 per US Dollar, thereby ignoring almost all of the tremendous fall from a September high against the US Dollar. The forecast seemed to cause a short squeeze which led to USD/JPY falling back below the 93.00 line. The Yen gains were starting to unwind when Japan Finance Minister Aso said the pace of the Yen weakening has been to fast. His comments pushed USD/JPY right back down to 92.50, about where it is trading at the time of this writing. --- Written by Benjamin Spier, DailyFX Research. Feedback can be sent to bbspier@fxcm.com .